The image for Day 261 of the VM_365 project shows two aspects of the archaeology of Drapers Mills, Margate, both from very different periods but occupying the same landscape. 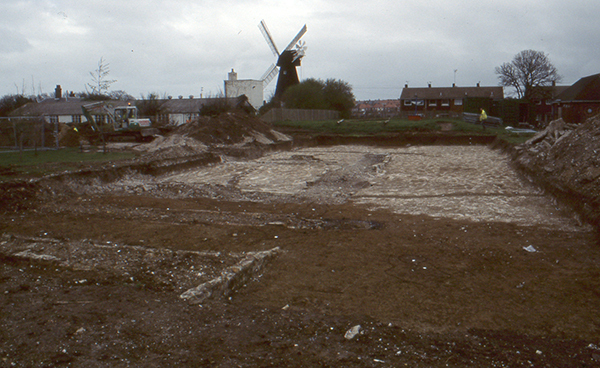 In the foreground of the image the excavation of a Late Iron Age or Early Roman enclosure is taking place on the playing field of a school. The ditched enclosure is located on the periphery of the site of a Romano-British villa, which was disturbed by the construction of the school in the 1930’s and investigated by excavations between 1959 and 1961 and again in 1981. The villa probably replaced a small Iron Age settlement, which lay within the enclosure ditch. A filled in chalk quarry from the Roman period in the 2nd century AD, located near the houses to the right of the mill in the image, produced the cast bronze head of a boxer which appeared in the image for Day 17 of the VM_365 project. A wooden box storing a collection of the samian pottery from the villa excavations of 1959 to 1961 in the same area featured in VM_365 Day 86. In the background at the centre of the image is Draper’s Mill, a smock mill constructed in 1845 by the Canterbury millwright John Holman. A smock mill has a sloping body, with a cap at the top that rotates so that the sails can be turned to face the wind. The windmill is the last survivor of three mid 19th century windmills that that once stood together on this rounded downland hilltop. Draper’s Mill was threatened with demolition in 1965, but was saved and restored in 1968. Early maps show windmills occupying the hilltop near Drapers Mill as early as the 17th century, and it is likely that there were earlier post mills near the site in the medieval period, standing on similar trestle platforms and possibly within circular enclosures, to those at St. Peters and Sarre that were shown on VM_365 Day 259 and Day 260. The hilltop site overlooking the bay at Margate has been occupied for many thousands of years and its history is written in the archaeological record, both above and below ground. How about an archaeological exhibition at the Mill for Heritage Open Day 2016 ?